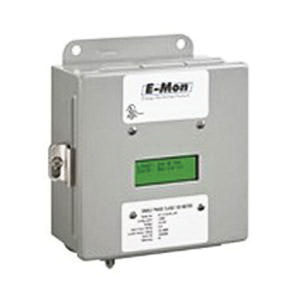 E-Mon D-Mon Class 1000 KWH submeter provides an accuracy of +/-0.2% from 1 to 100% of rated load. It has a voltage rating of 120/208-Volts and current rating of 200-Amps. The 1/2-Phase, 3-Wire submeter has 2-line Alpha-numeric LCD display for reading. The flange mount submeter has industrial grade JIC steel construction for high durability and NEMA 4X enclosure for corrosion resistance. This standalone submeter features a non-volatile memory and comes with two split core current sensors and provides fixed pulse outputs. The KWH submeter meets UL, cUL and ANSI C12.20 standards.